Punktów : 400 Software is not compatible with mobile and tablet devices. Please add this title to your Wish List and sign on to your the first club account from a desktop computer to complete your redemption. 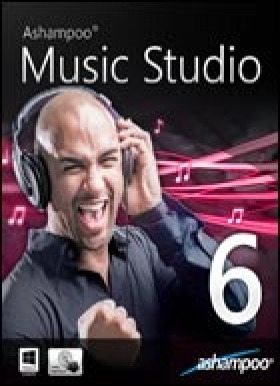 ABOUT THE SOFTWARE Ashampoo Music Studio 6 is the solution to create, edit, design and produce your own music files. Apart from file conversion into all common formats and classic features such as music ripping, normalization and cover creation the application comes with an editor to process / mix sound files and multiple functions to organize your music collection. Mic recording, music extra… ction from audio tracks and the creation of individual mix tapes with cross fading support complete the positive picture. Version 6 includes a newly designed editor that supports music editing with up to three separate tracks. Another newly added module automatically detects pauses and smartly splits up audio books or live concert recordings into separate files. With the added support for AAC/m4a, iTunes files can now be converted and burned. The application can also create playlists for nearly every music device.KEY FEATURES	Completely redesigned editor with up to three separate tracks Audio CD ripping with automatic track and cover searching Automatically detect and cut pauses Create playlists in all common formats Burn music discs and create covert artwork Extract audio tracks from videos Batch-process and normalize tracks Track auto-labeling with customizable settings Improved user handling in many modules Sound optimization with equalizer Burn and convert AAC/m4a files (iTunes compatible) Automatically label tracks based on ID3 tagsSYSTEM REQUIREMENTS	OS: Windows Vista, Windows 7, Windows 8 CPU: 2,4 GHz (or higher) CPU. RAM and disk space: 1024 MB RAM Software: Microsoft .Net 4.0 Framework Computer: Any computer that runs one of the above operating systems at a reasonable speed, graphic adapter min.resolution 1024 x 768 with 256 MB memory and 16-bit High color, CD/DVD/BD-Writer.